Simply incredible. Lindy was an amazing guide, who made the best part of our trip even better. It’s worth the cost (and waking up early!) to get to see the Vatican and museum in a way so few get to do. Book early and don’t have a second thought. 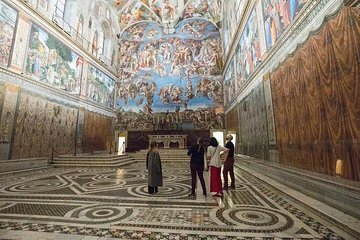 We took the "Waking Up the Vatican VIP Small Group Tour" on our recent trip to Rome. Tiffany was our tour guide and she was great! Very knowledgeable, easy to hear and understand, and very pleasant. She even shared a list of her favorite places to eat in Rome. This tour was absolutely amazing and one of the highlights of our trip! It is expensive and you have to get up super early to go, but it is totally worth it. The tour included a tasty breakfast at the end. We were able to stay inside the Vatican Museums and look around on our own after the tour was over. Once we were done at the museum, we took advantage of the secret passageway to St. Peter's Basilica (shown to us by Tiffany) and avoided having to wait in a separate line for that. Overall, this tour was a great experience and we would highly recommend it! It is a one of a kind experience to explore the place with a very small amount of people, although I must admit, it wasn't as good as advertised. It felt so rushed! we started at 6AM on the dot but finished tour at about 7:30ish as the general public is "coming soon"... Some "doors" that you open is basically just a door being opened and took quite a bit of time from the short tour... Overall, its not bad, its unique in anpositive way but not a MUST SEE esp considering the price too... breakfast is good.. Wonderful..wonderful .Able to take pictures in Sistine chapel! So beautiful! Guided thru museums also. Great breakfast at the end and short cut to St Peter's Basilica. Opening doors with clavegero ...exciting!! !Very intimate and informational. Tiffany...OUR GUIDE...very professional and spoke perfect English very eloquently. SHE made the tour fun too!! Very best way to see this and money well spent. Last time I saw with throngs of people..ugh! This really was the best tour we have ever taken while traveling. Our guide, Tiffany, was very personable and even more knowledgeable. The entire experience definitely had a once in a lifetime feel to it. Having been to the Vatican before, almost thirty years ago, it was remarkable to see those priceless works of art and especially the Sistine Chapel as one of a group of 18 instead of just a face in the throngs of people pushing their way through the rooms. To my knowledge no one is allowed to take photos in the Sistine Chapel but if you are on this tour you can. We spent 10-15 minutes in the Chapel while Tiffany told us about every inch of it. I will never forget this very special experience. This was an incredible experience and we definitely do not regret the cost, totally worth it. Opening the doors, turning on the lights, no crowds to battle thru or to obscure any view, an amazing tour guide Tiffany - all in all just fantastic. Tiffany was interesting, knowledgeable and extremely nice, she also gave restaurant tips which turned out to be spot on. Do the tour, you will not regret it. This is beyond any doubt the best travel experience we have ever had. It is just amazing! We met our tour guide, Becky, before dawn at the door to the Vatican Museums. She was very nice and knowledgeable, you could not ask for a better tour guide. For the next few hours, we walked through the galleries, no rush, before the public was allowed in, switching on the lights and opening the doors using the big, old keys on the giant keys rings used by Vatican staff. BONUS: Our key holder was the one who actually broke conclave when the cardinals elected the pope! Words cannot do justice to the experience of standing in a dark gallery that explodes into color when the lights come on. The highlight, by far, is the Sistine Chapel. Most people experience it as a room packed full of people, noisy and rushed, no pictures allowed. We, however, had it to ourselves, got to spend as much time as we wanted exploring all of the incredible details, and taking all the pictures we wanted. You even get a buffet breakfast, featuring priducts from the Pope's own cows (no joke), followed by a self-guided tour of the basillica and the rest of the Vatican, which would have been great all by itself. If you can do this, by all means, do it! Wonderful opportunity to process the grandiosity of the buildings, art and history of the museums before the crowds arrived. Tiffany our guide was professional and very informative. If it's in your budget it's worth it. Excellent, unforgettable experience. It was worth every cent. The Sistine Chapel was amazing. Words cannot describe the experience. It sent chills upMy spine when the lights were turned on. Amazing.